Loren Schultz works with food animals, but he is a “hoofer” in his own right. Schultz, DVM, MS, devotes his days to four-legged creatures, but has been leaving all that jazz behind during recent evenings to cut loose on his own two feet. 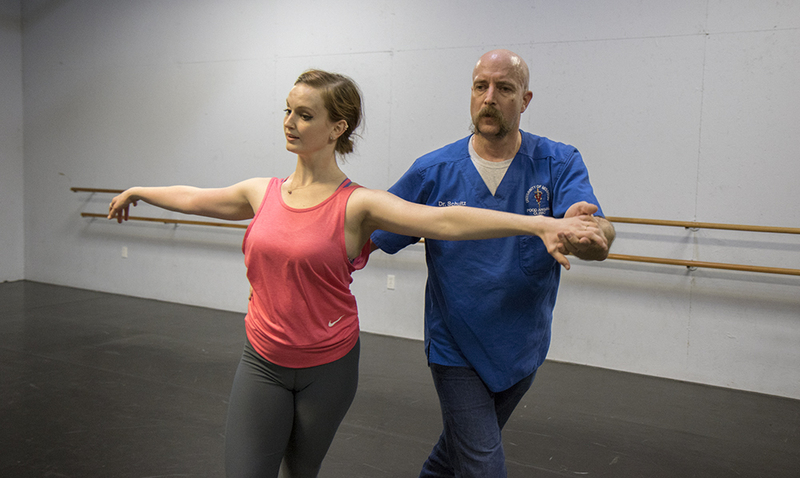 CVM Associate Teaching Professor of Food Animal Medicine and Surgery Loren Schultz is paired with professional dancer Nicole Bell, who also teaches dance at Schultz’ daughter’s school, for this year’s Dancing with Missouri Stars. An associate teaching professor of Food Animal Medicine and Surgery at MU’s College of Veterinary Medicine, Schultz is preparing for the 12th annual Dancing with Missouri Stars (DWMS), a mid-Missouri version of the popular television show and a fundraiser for Missouri Contemporary Ballet (MCB), the area’s only professional dance company. Schultz will be one of eight local celebrity dancers, each of whom pairs with a professional dancer from the MCB and competes to raise the most pledge money. Scheduled for May 17, DWMS is a popular area social event, expected to draw about 1,000 attendees to Columbia’s Holiday Inn Expo Center to support MCB. Schultz and his professional dance partner, Nicole Bell, will perform two dances, a box-step waltz and a jive. The waltz is a familiar, gliding, closed position dance in three-quarter time. The jive, as popularized by bandleader Cab Calloway in the ’30s, is a swing dance performed at an even faster tempo. “I’m learning a lot,” Schultz says. “I’ve done the box-step waltz before, so I kind of knew the basic footwork, but other than that, everything Nikki has put in there is completely new to me. ‘Humble and Kind’ by Tim McGraw is the music for our waltz. Both the music and costumes reflect Schultz’s Nebraska roots. Bell recruited Schultz to participate in the event. “Nikki teaches at my daughter’s dance school,” Schultz says. “Every year, the school has a recital that includes a dad dance and a daddy-daughter dance. She picked me as someone who might be able to do this and not get too embarrassed. That’s how I got roped into it. On May 4 during a dancing fundraiser at the Backdoor Lounge in Midway, attendees can donate to dance with Schultz or Bell. On May 5 there will be a bingo night at The Dance Academy. The $10 admission charge includes bingo, food and family fun. Schultz isn’t the CVM’s only high stepper. Craig Franklin, professor of veterinary pathobiology, is on the MCB’s Board of Directors and participated in DWMS two years ago. Schultz and Bell will perform a waltz and jive as part of a benefit for the Missouri Contemporary Ballet. “My experience consisted of two or three months of anxiety over my left foot,” Franklin says. “I met so many incredible people from the arts community, and the Columbia community in general. On dance night, I actually pulled it off and could not wipe the smile off my face. It was so much fun, I actually had several months of rehearsal withdrawal. Loren knows his way around the dance floor and seems much calmer than I was. He is in for a great time. I hope we can help him raise a ton of money.